Opened in 1964 to allow the general public a look behind the scenes into the fascinating world of movie making, Universal Studios Hollywood was an immediate hit. After all, many tourists heading to Southern California on vacation were enamored with the idea of catching a glimpse of the glamorous world of the cinema (and maybe even a "movie star" or two!) and Universal allowed them to be a part of all the excitement, if only for an hour or two. Indeed, Universal Studios is the largest film and television producer in the world - with more than 9,000 employees overseeing the operations - so who would know more about the world of movies than this well-known company? Combine that knowledge of movies and the movie industry with high-action thrill rides and entertaining shows, and you have a theme park that's ranked among the top 10 in the United States. 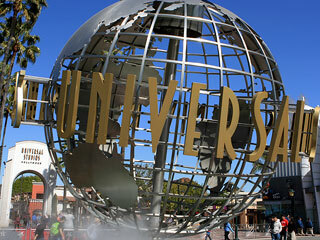 Universal Studios is only ten minutes away from the attractions on Hollywood Boulevard. You can easily get there by car (Hollywood Freeway or Highland/Cahuenga), by bus (Metro Local 156), or by using the Metro Red Line train.